"Today we will talk about the future that we make," said #CivicTech activist Noel Hidalgo in his opening remarks at We Built This City: The State of Civic Technology, a panel organized last week as part of Social Media Week in New York City. Hidalgo went on to outline what he calls the Four Freedoms of the 21st Century (detailed above), which build upon the historic goals outlined by FDR in 1941. In Hidalgo's update, each new goal shifts from a focus on individual human rights to more social, communal aims. To speak and worship, to live free from fear or want—these are things that we do as individuals. 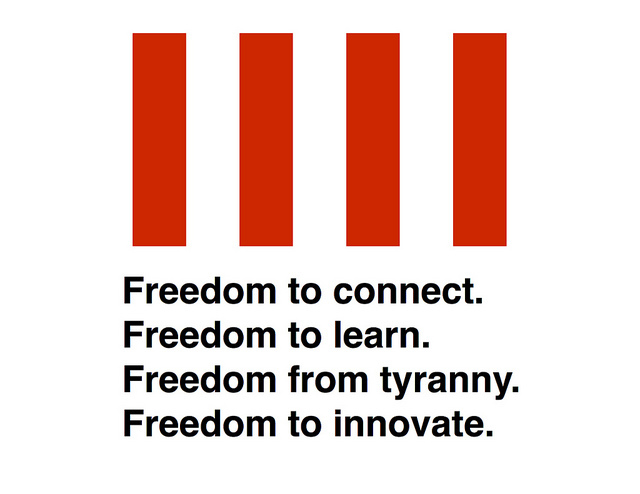 To connect, learn, innovate, and fight tyranny—these are things that we do together. These freedoms don't replace FDR's original four, but build upon them, offering a thoughtful set of next steps for anyone thinking about how new social technology can be used to create more equitable communities. Democratic governance, after all, is a social process, and new tech is only making it moreso. At that same panel, PPS's Daniel Latorre noted that "Beacuse of all the technology that's sprouted up, there's a greater potential for how 'informal' citizens can work with the 'formal,' staffed citizens who run the city's departments." But, he and the other panelists asserted frequently, it is critical to remember that all citizens, whether they work formally for City Hall or not, are just that: citizens, neighbors, equals. A city is the physical point at which thousands or millions of individual social networks overlap. It is the interconnectedness of our many varied webs that creates a unique sense of place within each neighborhood. The interaction between people is what flavors public spaces, and makes one place feel distinct from the next. As SeeClickFix founder Ben Berkowitz put it at another SMW event, It's My City: Civic Participation in Urban Development, "Every individual carries their neighborhood...and your personal neighborhood evolves as your life changes." Technology is making it easier for people to connect to the places that they inhabit by leveling the social playing field. The tools that are being created are not ends in and of themselves; much like the Placemaking process, they are the means for bringing people together: to connect, to learn, to innovate, and to feel welcome to do so. Below are thoughts from the two aforementioned SMW events that highlight technology's role in strengthening local human networks in-place, in relation to each of Hidalgo's 21st Century Four Freedoms. On the freedom to connect: "Technology," said Latorre, "is only 10% of the problem. 90% of it is about the organizing & research to find out who you're trying to connect with." Wherever you are in a city (or town), there are dozens of potential partners and collaborators within spitting distance. We need better digital tools for finding local people and organizations to connect with in order to get things done. On the freedom to learn: "The creators of new ideas don't have to be within your organization to be helpful," noted Betsy Scherzer, the project manager for the NYC BigApps competition, at We Built This City. But once an organization has decided that it's ready and willing to learn from people outside its normal circles, the question (according to Scherzer) becomes, "How do you incentivize outsiders to contribute to what you want to solve? Then, how do you curate the response?" In other words: how can tech help us find the right teachers? On the freedom from tyranny: "If citizens don't start cooperating city-to-city, there will be no checks and balances for something like the IBM Smart City control center that was 'gifted' to Rio," cautioned Meu Rio co-founder Alessandra Orofino during the It's My City panel. "Whoever designs the interface holds a whole lot of influence." If you plan for people and places, you get people and places; if you plan for cars and traffic, you get cars and traffic. More and more, tech is a vital planning tool, so make sure that the tools your city uses are focused on people and places. On the freedom to innovate: Collaboration, and the cross-pollination of ideas by people with many different backgrounds, is what creates bursts of human creativity and innovation. "We now have tech so completely embedded into whatever we're doing," argued Hidalgo at It's My City, "so when we talk about technology, we forget that when we build communities of practice, that's also a technology that we're applying to ourselves to strengthen our communities." Tools that bust down silo walls and create more connectivity between the tangential networks that exist in a given place are key to innovation. Technology can be hugely helpful in strengthening communities. It can also be a huge distraction. The key is to make sure that new tools serve people first. That's a self-reinforcing process. The more people there are paying attention and making their voices heard in the discussion about how technology can strengthen offline networks, economies, and places, the more likely it will be that new tools will be designed to make the dialog even more inclusive. In order to change the way that cities are run, the #CivicTech movement should lean more toward civics, and less toward tech. Every citizen has a seat at the table, and technology's job right now is to help people understand how they can have an impact on their communities. In Latorre's words: "The cities that are more open, that are early adopters, are the ones where the citizens are more in charge than the technocrats. The next time you find yourself in a conversation about technology, stop—and start talking about outcomes and goals. Get out of the tiny little box of technology."